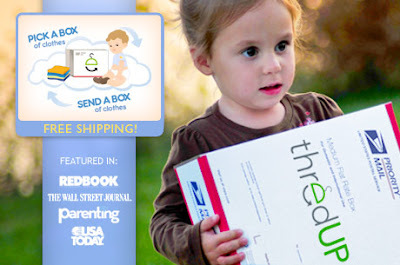 As low as $8 for a thredUP Box of Pre-loved Kid's Clothes, Toys + Books, $20 Value! Head over to Eversave and you can get a thredUP box full of gently used children's clothing for as low as $8.00! The only catch is that you need to be a new thredUP member. The deal is on sale for $10, but if you're a new Eversave member, you'll get a $2 credit, making it just $8. Also, if you purchase this deal and share it on Facebook or Twitter, you'll get another $2 in credit that you can use on a future Eversave purchase! You can easily search for the clothes you need by gender, size, season, even by brands. The average box on thredUP contains 15 clothing items and includes top brands like GAP, Carter’s. Children’s Place, Osh Kosh and Gymboree. I recently bought my first box of clothes from thredUP a few weeks ago, and was very impressed with what I got. I received 17 items, with 13 of them being Carter's brand 2-piece spring/summer outfits for my son and 4 rompers. You'll get your redemption code immediately after you purchase so you don't need to wait to redeem a voucher!